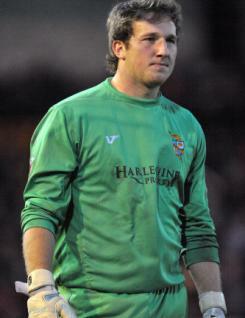 Chris Martin is a young goalkeeper in his third season as a professional at Port Vale. Chris developed in the Vale youth team before making his League debut in April 2008 at the age of 17. He was mainly used as the reserve ?keeper in the 2010-11 season, being understudy to Stuart Tomlinson, but he did manage to make 16 appearances altogether, two of which were from the bench, catering for a sending off and an injury. A good shot stopper, he ended the campaign injured, as he dislocated his shoulder trying in vain to save a penalty in the last game of the season at Barnet.